A terrifying execution of Russian ambassador to Turkey sparked stories of WWI, in which a single fatal shot to a dignitary launched the world into the first great war made possible due to complicated alliances – much like the global hornet’s nest that is Syria. The attack complicates already fragile talks between Russia and Turkey, countries defined by leadership that is insolvable, immovable, and culturally anchored to the idea of honor. The attack also came at the heels of critical talks hosted by Russia between Russia, Turkey and Iran on evacuating civilians in Aleppo – scheduled for just 24 hours later. Russian foreign ministry spokeswoman Maria Zakharova has called the attack an act of terrorism particularly egregious because of Ambassador Karlov’s status as an esteemed statesman. Ambassador Karlov had also served as Russian ambassador to North Korea. He was assigned to an ambassadorship in Turkey in July 2013 during an international crisis that saw a Russian jet shoot down a Turkish plane, a conflict that was only recently resolved diplomatically. 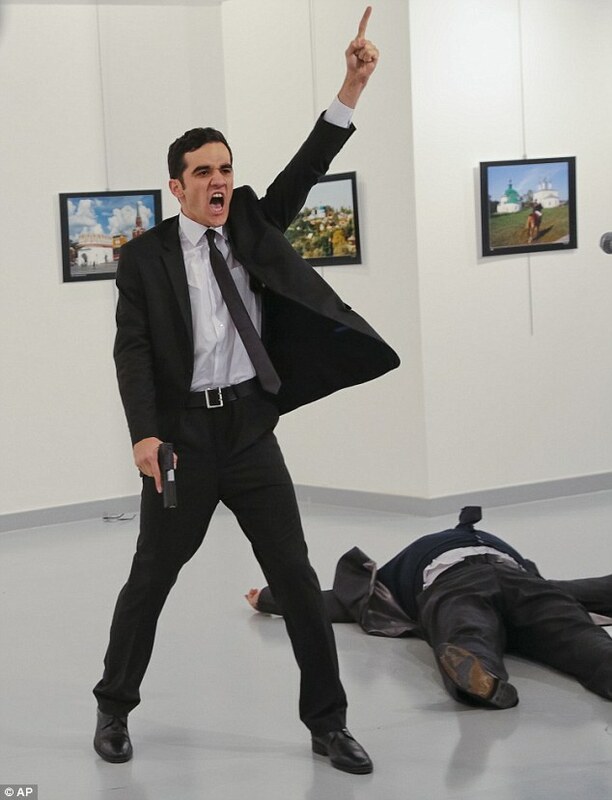 Was the Ankara Shooting an ISIS Attack? Immediate media reports across multiple trusted global agencies describe Altinatas as a “gunman”, minimizing speculation as to motives. Nevertheless, he demonstrated a common mark of allegiance immediately after the attack: the tawheed. The pointed index finger into the air, signifying “God is One,” is the trademark gesture of ISIS and lone wolf attacks who have pledged their allegiance to the world’s most underestimated terror franchise. Dark web chatter shows Altinatas already being immortalized in back channels by ISIS supporters through memes and avatars. So far he has not been claimed by ISIS as an agent. Within the first hour of the attack, in the U.S. leftist personalities exploited the attack to scapegoat the incoming administration of President-Elect Trump as provoking an already volatile situation through what is seen as extreme positions and intense personalities. In fact, a level of intensity and conviction is exactly what it takes to successfully engage on a world stage with ancient powers. Fabricating a link between Ankara and Trump is a desperate association symbolic of spiraling media failure. Leftist rhetoric also fails to recognize the attack as ‘terror’ by identifying the assailant as a gunman, negligently ignoring the extremist mindset that pulled the trigger. Judging solely by the tawheed and the declarative statement, that mindset is Islamic extremism. In what was the most horrific act of terror on national television, in a moment of paralyzing realization of the events as they unraveled, a significant percentage of the population still cannot identify violent outburst of this totalitarian ideology. Both positions by U.S. leftists – whether blaming Trump or denying the radical Islamist element – also ignore real-time global chatter speculating on Altinatas allegiance, his placement on the scene, as well the questioning of more covert nefarious agendas that hamper global diplomacy at a crucial time. It shows leftists media and personalities as completely disconnected with reality, preferring instead to dip into their own brand of fear-monger over facts. The Mayor of Ankara, Melih Gokcek, tweeted his speculation linking the shooter to Fethullah Gulen, an exiled cleric accused by Turkish authorities of being responsible for this summer’s Turkish coup. The situation is further compounded by recent Turkish protests against Russian interference in Syria. Two days ago 5,000 cars were driven to the Turkish border, packed with supplies for Syrians fleeing the fall of Aleppo. Meanwhile, “ultranationalist leader” Vladimir Zhirinovsky is blaming Britain, adding that “The West is trying to embroil us. All conflicts were inspired by Britain.” During the U.S. presidential elections, Zhirinovsky had also warned Americans that a vote for Hillary Clinton was a vote for nuclear war. Zhirinovsky believes the assassination is a western operation designed to damage ties between Turkish President Tayyip Erdogan and Russian President Vladamir Putin. Appearing on RT.com, a Russian media outlet, Putin confirmed the assessment that foreign interests were seeking to undermine “the normalization of Russian-Turkish relations and destabilize progress in Syria as led by Russia, Turkey and Iran.” At the moment, relations between Erdogan and Putin seem to remain unshaken as Erdogan immediately reached out to the Russian President in what has been described as a panicked phone call. Putin also stressed an inquiry into “who gave the orders.” This is a key question considering Atlinatas was appointed as security for the ambassador. If he was someone’s assassin, and not just an independent actor, the murder was part of a wider plan. And that’s exactly what the killing appeared to be – an act on a stage with a world audience. The question is who designed the opportunity for such impeccable optics. The Russians seem to be claiming that this was a false flag operation lead by the U.S. However, the incident is more plausibly a joint false flag operation between Russia and Turkey. The venue chosen was an art exhibit aimed to further Russian-Turkish friendship. That the shooter was a police officer can be used to justify Erdogan’s purge of military and police forces, or even to redouble his efforts to purge them. The killing by someone claiming to be aligned with the Aleppo resistance offers a reason to justify Russia’s preferred policy towards Aleppo, just 24 hours before the talks that Russia, Turkey, and Iran are holding on the disposition of Syria. However, until intelligence officers verify the speculation, the obvious leading contender responsible for the attack is ISIS. In the last year, the Islamic State has carried out multiple terror attacks in Turkey. This may well be another one. Shireen Qudosi is a Muslim writer based in California. Israeli Ambassador to USA Slams SPLC for "Practicing Intolerance"